The Eels Family: [Article] Jang Keun Suk ~ Affection and a sense of responsibility towards ‘Produce 101’:"I feel more tension than the usual filming"
[Article] Jang Keun Suk ~ Affection and a sense of responsibility towards ‘Produce 101’:"I feel more tension than the usual filming"
Jang Keun Suk’s appearance as the MC and mentor of ‘Produce 101’ has become the hot discussion topic. 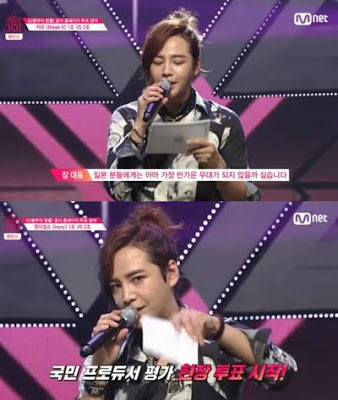 Jang Keun Suk has been showing a figure of a strong representative in "Produce 101" as the mentor of the girls and the messenger that leads the whole program as well as the overall progress. Eventually, he becomes the MC in the stage conveying the evaluation results and demonstrates exceptional charisma as a calm jury. Jang Keun Suk who celebrates his 25th debut anniversary this year has shown himself as a multi-talented entertainer through a variety of performances as an MC, singer and DJ. Jang Keun Suk previously revealed that “through my own experience, life and values, I would like to be the messenger who brings the trainees closer to reaching their own dreams and aspirations". It’s also mentioned by the staff of the program that Jang Keun Suk feels like he has a sense of responsibility and burden more than his usual filming experience that shows his affection and genuine feelings towards ‘Produce 101’. His true value will be revealed further during the broadcast on the 19th (of February). Meanwhile, ‘Produce 101’ is an ultra large scale project that gathers female trainees from various entertainment agencies. The public becomes a ‘national producer’ who selects the members, the name and the debut song for this national girl group. It’s broadcasted in Korea every week on Friday starting 11 pm. Eels have always known of the sense of responsibility Jang Keun Suk has toward any project he is taking part in. I'm not surprised he feels this same responsibility for the trainees of Produce 101. So glad that the media is recognizing this side of Jang Keun Suk! It's been great to see all the positive press he is getting this year! Thanks for translating these articles for us TEF!